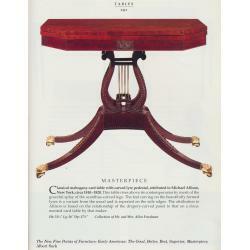 Lyre card tables and work tables are found in many collections and museums, but a tilt-top table in the lyre form is unknown. 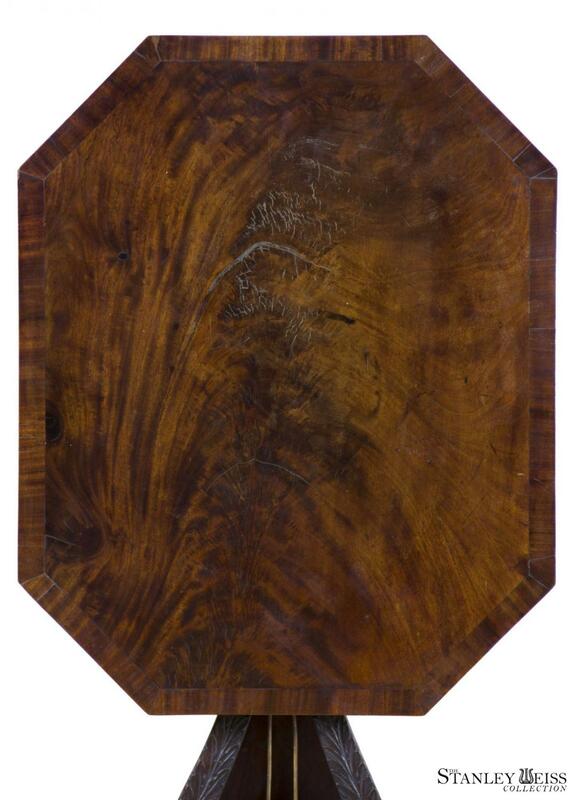 This table came out of the collection of Joan Oestreich Kend (highly regarded collectors) handled by Sotheby’s. They attribute the table to Duncan Phyfe, although it may relate to Philadelphia work, in the mode of Quervelle or Haines & Connelly (see related card tables sw01061 & sw01240 in our collection). 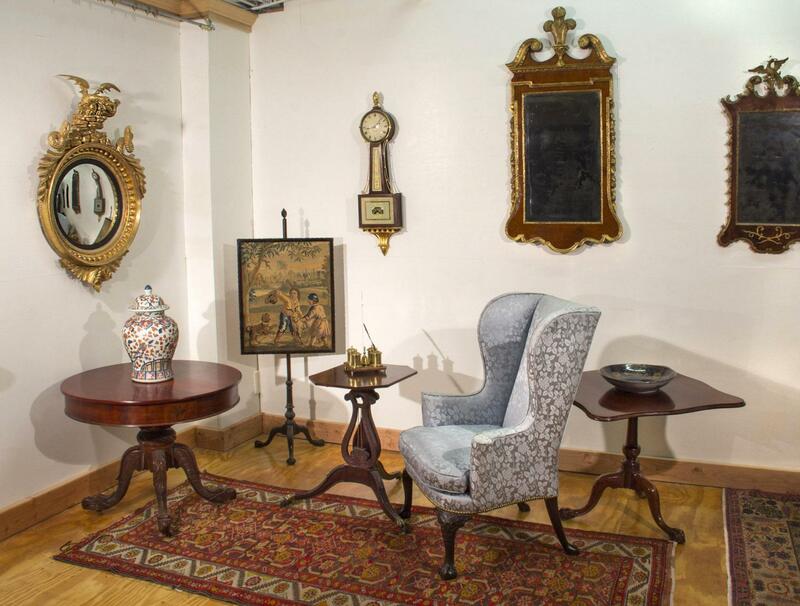 We believe Erik Gronning of Sotheby's--a well-respected expert in the field--considers this table Phyfe because of the precise shopwork techniques. 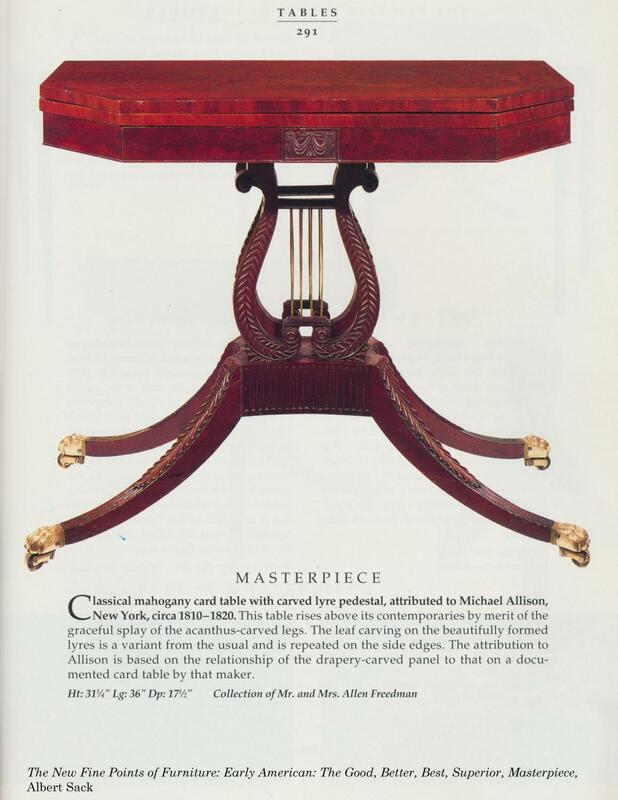 Another example of a typical Philadelphia lyre form is attributed to New York cabinetmaker Michael Allison (a Phyfe contemporary) and is illustrated in Albert Sack's The New Fine Points of Furniture: Early American: The Good, Better, Best, Superior, Masterpiece, listed as a masterpiece (see below). When opened, and especially when closed, this table presents a dramatically sculptural appearance. Notice how the lyre is elongated and how it closely relates to a particular card table in our collection with similar elongated lyres (see sw01061). 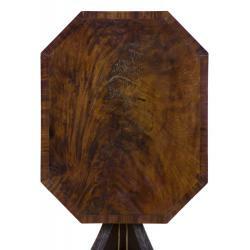 The table is in superb condition and retains a very old surface, completely original, the top being French polished. 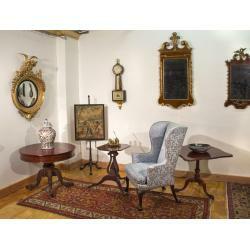 We have had Alan Miller, an eminent authority in American furniture, examine the piece. His report is available upon request. This is truly a treasure of the American classical form, and a great rarity.